Yesterday’s kitty must be related to Skit (not her real name but chosen for skittish behavior). Perhaps they’re littermates, or today’s furball is the kitten; she’s not exactly the biggest beast on the block. Their coloring is similar, but obviously not exact being two different cats. 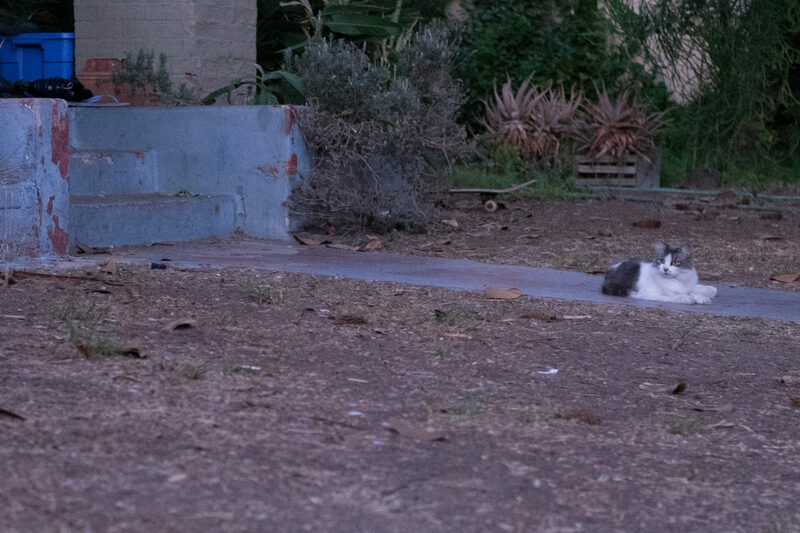 I spotted the felines, two houses apart, down Meade off Arch, on Nov. 10, 2016. For low-light shooting, I outfitted the Fujifilm X-T1 with Fujinon XF35mmF2 R WR lens. Vitals for the Featured Image: f/2, ISO 5000, 1/60 sec, 35mm. Shot at 5:08 p.m. PST, about 20 minutes after sunset, the image is approximately 90-percent cropped. Also in this series: Scruffy, Roly Poly, Woo, Skull, Biscuit, The Colonel, White, Chipper, Frisky, Stretch, Needy, Farfisa, Mates, Hunter, Pee-Pee, Blue, Blue Too, Bonded Pair, Patience, Fess, Jumper, Frenemy, Looker, Cozy, Scout, and Lurks.